Here are some quotes and notes taken from "The Jesus Mysteries" by Timothy Freke & Peter Gandy (1999). The book is a summary of the theories and history of the Dead Sea Scrolls, with a lot of introductory text to each area of study. Quotes in my website are taken from 2000 paperback edition. Published by Thorsons, London, 1999. The traditional history of Christianity is hopelessly inadequate to the facts. From our research into ancient spirituality it has become obvious that we must fundamentally revise our understanding of Christian origins in the most shocking of ways. Our conclusion, supported by a considerable body of evidence in our book, The Jesus Mysteries, is that Christianity was not a new revelation. It was a continuation of Paganism by another name. The gospel story of Jesus is not the biography of an historical Messiah. It is a Jewish reworking of ancient Pagan myths of the dying and resurrecting Godman Osiris-Dionysus, which had been popular for centuries throughout the ancient Mediterranean. The stories told about Osiris-Dionysus will no doubt sound familiar. He is the Son of God who is born to a virgin on the 25th of December before three shepherds. He is a prophet who offers his followers the chance to be born again through the rites of baptism. He is a wonderworker who raises the dead and miraculously turns water into wine at a marriage ceremony. He is God incarnate who dies at Easter, sometimes through crucifixion, but who resurrects on the third day. He is a saviour who offers his followers redemption through partaking in a meal of bread and wine, symbolic of his body and blood. The Jesus story is a synthesis of the Jewish myth of the Messiah Joshua (in Greek Jesus) with these Pagan myths of the dying and resurrecting Godman. It is hard for us today to imagine the Jesus story being consciously created, but this is because we have misunderstood ancient spirituality. Myths were not seen as untruths as they are now. They were understood as allegories of spiritual initiation, which encoded profound mystical teachings. Reworking old myths to create new ones was a standard practice in the ancient world. The conquests of Alexander the Great had turned the Mediterranean world into one culture with a common language. This created an age of eclecticism, much like our own, in which different spiritual traditions met and synthesized. Jewish mystics of this period, such as Philo Judeas, were obsessed with synthesizing Jewish and Pagan mythology. In light of all this, it is actually no surprise that some group of Jewish mystics should synthesize the great mythic hero of the Jews, Joshua the Messiah, with the great mythic hero of the Pagans, Osiris-Dionysus. At the time, both Pagans and Christians were well aware that the Jesus story was a myth. The early Christians, known as Gnostics, understood the Jesus story as allegory, not history, and even called Jesus by the names of the Pagan Godman. The Gnostics were brutally eradicated by the Roman Church in the 4th and 5th centuries, and since then we have believed the official propaganda that these Christians were dangerous heretics who had gone Pagan. Actually the evidence suggests the opposite is closer to the truth. The Gnostics were the original Christians, just as they themselves claimed. They had synthesized Jewish and Pagan mythology to produce the Jesus story and many other extraordinary Christian myths largely unknown today. The Roman Church was a later deviation, which misunderstood the Jesus story as history. It was, as the Gnostics said at the time, an imitation Church teaching a superficial Christianity designed for the masses. Roman Christianity, and all its subsequent offshoots, is based on the idea that if you believe in the existence of an historical Jesus you will go to heaven when you die. For the Gnostics, however, Jesus is an everyman figure in an initiation allegory. They taught that if you yourself go through the process of initiation symbolized by the Jesus myth, you would die to your old self and resurrect in a new way. The Greek word we translate as resurrect also means awaken. For the Gnostics, Christianity was about dying -- the idea of giving up your mortal body and awakening to your immortal essence as the Christ within �- the One Consciousness of the Universe. This mystical enlightenment was not something that happened after death, but could happen here and now. The historical figure of Jesus has been so central to Western culture that it is hard to question his existence. As soon as we hear his name we can see him in our mind's eye, in his flowing white robes, with long hair and a beard. Yet this picture of Jesus was not created until the 8th century. Early portrayals of Jesus show him clean-shaven with short hair and wearing a Roman tunic. St Paul says that long hair disgraces a man, so presumably his image of Jesus was not the same as ours. The fact is that everything we think we know about Jesus, like this romantic picture of the bearded saviour, is a creation of the human imagination. Actually there is barely a shred of evidence for the existence of an historical Jesus and this dissolves on closer inspection. Paul, the earliest Christian source, shows no knowledge of an historical man, only a mystical Christ. The gospels have been thoroughly discredited as eyewitness reports. Other bits of traditional evidence, such as references to Jesus by the Jewish historian Josephus, have been shown to be later forgeries. If solid evidence had existed, there would have been no need to have created such fabrications. A little over a century ago most people believed the story of Adam and Eve to be history. To most thinking people today it's obviously a myth. We predict that within a generation a similar revolution will have taken place in our understanding of the gospels. People will look back at the beginning of the 21st century and be amazed that a culture with the technology to travel to the moon could see the fabulous story of Jesus as anything other than a myth. However, we do not want to dismiss the Jesus story as nonsense. For us it is truly the greatest story ever told, because it has been thousands of years in the making. It is a perennial tale that has fascinated the human soul since the dawn of time. Whilst our ideas clearly rewrite history, we do not see ourselves as undermining Christianity. On the contrary we are suggesting that Christianity is in fact richer than we previously imagined. According to the original Gnostic Christians, the Jesus story is a perennial myth with the power to impart the mystical experience of Gnosis, which can transform each one of us into a Christ, not merely a history of events that happened to someone else two thousand years ago. Bane of Monotheism: Types of Christianity in History: Who Were the First Christians? 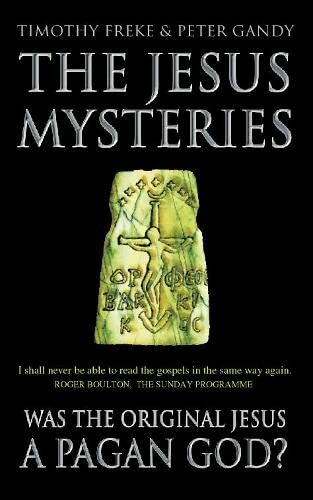 (1999) The Jesus Mysteries. Paperback book. 2000 edition. Published by Thorsons, London, UK. Book Review.